Sachems could have more than one wife, paid tribute or received and redistributed tribute from client bands, and lived on fortified heights or on easily defended river islands. In times of threat, leaders at Agawam and Wenesquawam, for example, would have governed from forts on hills or river islands in Newbury, Ipswich, Essex, Gloucester, Rockport, and Manchester-by-the-Sea that afforded good vantage points for detecting enemy raiders coming by sea. In addition to sagamores and sachems, bands and tribes often had temporary leaders with complete authority for special purposes, such as pilgrimages to sacred sites, hunting parties, envoys to allies, and war parties. In times of conflict, for example, a war chief called a muggumquomp (Anglicized to mugwump) was chosen in a caucus or appointed by the sachem or grand sachem of a confederacy or alliance.19 A confederacy was formed as an intended permanent union, while alliances were formed for particular, more or less temporary, purposes. Mugwumps often had the power to make war independently of, and even in opposition to, their peace-declaring leaders. Conflict resolution strategies in which mugwumps and their retinues of “braves” campaigned against each other were intended to conduct warfare on the sidelines and thus preserve security and normalcy in civilian life for the rest of the population. An analog might be a cross between gladiatorial combat and cyberwarfare. This breaking away of autonomous military authority was confusing to Europeans, who sometimes attacked peaceful villages and noncombatants on the assumption they had authorized or abetted the depredations of mugwump-led raids. From mugwump we get a term first used in the 19th century for politicians who on principle break from their party on some issue. 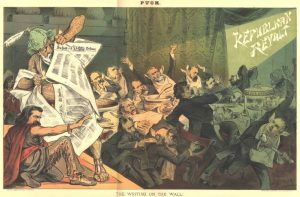 Like mugwumps behaving contrary to the wishes of their sachems, dissident Republicans were called mugwumps who bolted from their party in the 1884 U.S. presidential election over the issue of corruption. They supported the Democratic candidate Grover Cleveland instead of the Republican candidate James Blaine because of scandals associated with Blaine. 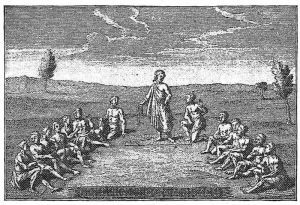 In addition to sagamores, sachems, and temporary or special purpose leaders, men and women specializing in spiritual leadership and healing were powerful and essential members of Algonquian bands. Powah (powwaw, powwow) is Algonquian for “shaman” and also for the public curing ceremony, purification ritual, or other rite performed or led by the shaman. By 1780 the English were using powwow as a verb meaning “to confer”, but powwaw literally means “one who has visions”. 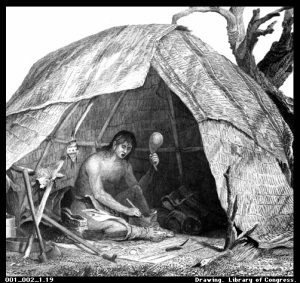 In this colonial depiction by an unknown artist, the shaman in his wigwam, surrounded by the tools of his trade, shakes a gourd rattle and chants while preparing a potion.